AED is equipped at the reception desk of Gotenshita Memorial Arena, and the sport consultant’s room in the training room. Note. The studio can be rented only for exercise use. Use the seminar room for other purpose. 1. 1. Wear suitable training wear and inside shoes. 3. 3. No eating is allowed. 5. Please share the space with others when crowded. 1. Please register as Gotenshita Club and make the reservation. See more detail here. 2. The audio system is not rented. So please bring own audio set. 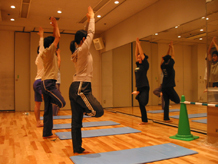 Copyright © 2010, 東京大学運動会 All Rights Reserved.